Once you get over 50 years old things begin to change. I still think I am 18 years old but my body tells me different. We decided to take care of the great gift God has given us — our bodies and our health. So . . .
. . . Janet and I got more serious about exercising and eating good foods. We’ve been using a free website LiveStrong.com which has been marvelous. Many others have joined us. Since January 1st I have lost 18 pounds and we’ve logged hundreds of miles walking in the country around our home and running on the treadmill. We also got rid of the junk food, fast food, and wasted calories. Janet and I have been reading SuperFoods: Fourteen Foods That Will Change Your Life along with other good books and materials. His excellent website with lots of ideas, menus and help is at www.SuperFoodsRx.com. I consolidated the info from the book into a simple chart for our family and all the grandkids. We put it on the refrigerator. You can click on the image for the full sized PDF and print it out for your family too! We have never felt better! All the bad things I inherited from my ancestors, such as a propensity for high blood pressure, high glucose, and high cholesterol have all dropped to very healthy ranges. It has taken some time and effort, but God only gave us one life, one body and we decided to treat it as the great gift it is. We challenge you to join us! Thanks! I printed it out — especially for the kids. Rob and I have been eating healthier ever since we did a fast for Lent two years ago. We’re planning another fast starting Wed. but not so drastic. Either a smoothie or juice fast for 10 days and then vegetarian for the rest of lent. We’ve got to get the exercise thing going too. (I just had a stress echo test — a wake up call.) Now that we’re out in the country I’ll have to start walking the property. Except I hate the cold! Glad you’re staying healthy so you can going to the Holy Land! It’s good that there are many people who are getting health conscious. They understand the benefits of having a healthy lifestyle. 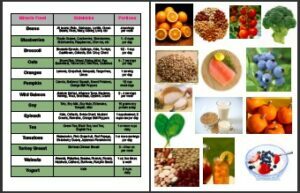 The link to the Superfoods chart seems to be broken, can you resorte it! I am still living in the “high” from our Holy Corss pilgrimage. I have a feeling it will last forever! Thanks again for a wonderful time. Steve Ray’s Blog » How Do They Cook Spinach in Rome?